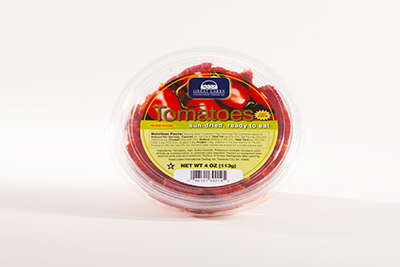 Sun-Dried Tomatoes: 4 oz Vac Pack Tubs « Great Lakes International Trading, Inc.
Moist, ready-to-eat Sun-Dried Tomatoes are an excellent flavor addition to any dish! 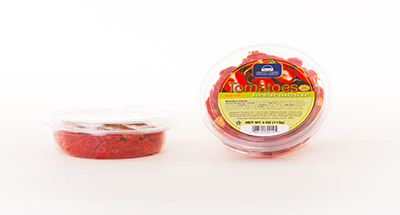 Wonderful in salads, pastas and sauces. No prep needed. UPC code #0-86101-30019-5. Product of Turkey. Great Lakes item #965. Each carton contains 12 x 4oz. net weight tubs. Each carton measures 10”x 10”x 4.5” = .26 cubic feet. The total net weight per carton is 3 pounds. There are 200 cartons per standard 40 x 48 pallet.